An old cliché that has stood the test of time is “It’s not how you start, it’s how you finish.” With this in mind, look at the two best teams in baseball as we have reached the mid-summer classic. The Los Angeles Dodgers are on fire with the best record in the big leagues, 61-29, winners of 26 of their last 30 games. Pitching ace Clayton Kershaw is 14-2 — that’s tops in MLB. Rookie sensation Aaron Judge of the New York Yankees with 30 home runs is the talk of baseball. The slugger has hit several long home runs. For a franchise with a history of legendary sluggers, the buzz has many dreaming and comparing him already with the past greatness of Babe Ruth, Lou Gehrig, Reggie Jackson, Roger Maris and Mickey Mantle. Houston has the best record in the American League, 60-29, with a 16-game lead in the AL West. The Dodgers are 39-11 at home and are +163 in runs scored. The Astros are +162 and 33-11 on the road. Both the Dodgers and Astros are clearly playoff-bound. The 2017 All-Star Game is in Miami, Florida. The 45-43 Twins are two and half back of Cleveland in the AL Central and have three All-Stars this year. Third baseman Miguel Sano has carried this team; he leads the team with 21 home runs and 61 RBI. Ervin Santana, 10-6, has been lights out, the ace of the staff. His ERA is 2.99 and he leads the Majors with four complete games. Closer Brandon Kintzler has 22 saves, among the best in baseball. Joe Mauer leads the team with seven game-winning RBI. His back has flared up on him, and he is currently on the disabled list. With 30 teams in MLB and only 12 of those having winning records, the fight for the playoffs will be the story of the season’s second half. I would like to see some of the teams that were expected to be in the playoffs play better, like the Chicago Cubs, who won 103 games last year and the World Series. So far they have been a major disappointment, 5 ½ games back of Milwaukee in the National League Central. We have a long way yet to go, and as I pointed out, it’s not always how you start but how you finish. However, some teams have dug some deep holes to climb out of in the second half. Just five teams in the National League have winning records. The Cardinals, Pirates, Blue Jays, Texas and Baltimore have not played consistently this year. The Twins will have a chance to stay in the race in the second half; however, they need Mauer back healthy. Pitching and defense have carried them so far. Young Jose Berrios is 8-2 and looking good. He and Santana give the Twins a solid one-two punch at the top of their starting rotation. Larry Fitzgerald can be heard weekday mornings on KMOJ Radio 89.9 FM at 8:25 am, on WDGY-AM 740 Monday-Friday at 12:17 pm and 4:17 pm, and at www.Gamedaygold.com. He also commentates on sports 7-8 pm on Almanac (TPT channel 2). Follow him on Twitter at FitzBeatSr. 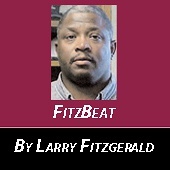 Larry welcomes reader responses to info@larry-fitzgerald.com, or visit www.Larry-Fitzgerald.com.